Aggrieved by the dismissal of Jermaine Jenas at Arsenal last Sunday, Newcastle were given the chance to benefit by an even more debatable red card when West Ham's Paul Konchesky was sent off in the 55th minute. Konchesky certainly appeared to have taken the ball when he ended a breakaway by Jenas, whose punishment last week was reduced to a yellow card after a recording of the incident was reviewed. It will be a major surprise if Konchesky is not similarly reprieved. Unlike Arsenal, Newcastle were unable to capitalise on their good fortune as West Ham's 10 men held out for the final 35 minutes, underlining why Graeme Souness is so desperate to sign a new striker. The defeat at Arsenal was one that never threatened to have serious repercussions for Souness because it was expected, but this was different. Victory over a newly-promoted side was essential to prevent his critics cranking up the pressure on a manager who has seen little go his way in recent months. Yesterday, Kieron Dyer and Emre Belezoglu were missing through injuries, depriving Souness of the two men expected to provide zip and ingenuity in the final third. Their absence meant Souness's squad was stretched and ensured a sentimental return for Lee Clark, named on the bench despite having rejoined the club in the summer expecting just to coach and play for the reserves. The possibility of a first-team future may even have crossed his mind as he watched Newcastle struggle to come to terms in an opening spell that was controlled by West Ham. With Hayden Mullins prominent in midfield, the London club retained possession for long periods. Just as the Newcastle supporters were showing signs of frustration, Souness's side started to make an impression. 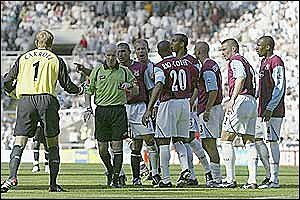 A mix-up between keeper Roy Carroll and Danny Gabbidon almost let in Lee Bowyer. Carroll was more decisive when he dealt with a shot by Charles N'Zogbia and he did well when Jenas made inroads into the area just afterwards. However, West Ham went closest to a first-half goal when Yossi Benayoun's 23rd-minute shot was half-saved by Shay Given and was heading over the line before Celestine Babayaro intervened. West Ham's justifiable optimism over their opening 45 minutes was swiftly extinguished within 10 minutes of the restart. First, they lost Teddy Sheringham's influence when he was substituted in the 48th minute after failing to shake off an injury received in the closing stages of the first-half. Then came Konchesky's dismissal. The referee, Dermot Gallagher, was persuaded to talk to his assistant who also had a good view of the incident, but the left-back was still shown what may turn out to be the unluckiest red card of the season. Newcastle, who defended in depth after Jenas was sent off at Arsenal, suddenly found the roles reversed as they continually attacked West Ham's 10 men. Carroll saved from Clark two minutes after the substitute went on and also turned over a shot from Bowyer, but Newcastle lacked sufficient imagination to capitalise on Konchesky's absence. Man of the match Roy Carroll - made several sharp saves.